1200 runners. 9 years. 5 kilometers. 3. 1 miles. A whole lot of Irish Attitude! 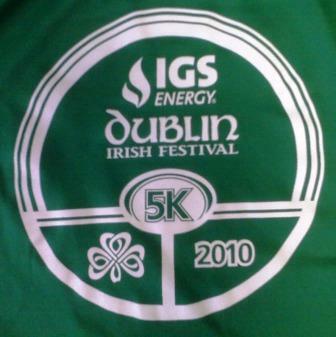 In 2002, the Dublin Irish Festival 5k became the Thursday “Kick-off” tradition for the now 23-year old Dublin Irish Festival. The first 5K was completed by a little less than 400 participants and now has registered 1200 runners from around Ohio. I will be running my first-ever 5k this evening. Why? Maybe it’s because I like a challenge, maybe it’s because registration includes a free festival ticket, maybe… just maybe the Irish Attitude has overtaken my thought process. Either way, I’m excited to see the community get together for such a great event. And it doesn’t stop at the 5k. Ha&apos;penny Bridge Imports of Ireland The Kells - 5:30 – 6:45 p.m.
Dublin Village Tavern Ceol &apos;n Craic - 7:30 – 10 p.m.
Brazenhead Homeland - 8 p.m. – 11 p.m.
BriHi Square Plaza Dublin Cornet Band - 6:15 – 6:45 p.m. Capital City Pipes & Drums - 7:30-8:15 p.m.
After my Irish warm-up tonight, I’ll be heading to the world-renowned festival tomorrow. The Dublin Irish Festival is now the world’s second largest celebration of its kind. More than 100,000+ guests are expected this year. Festival gates open Friday, August 6 at 4 p.m. on 29 acres in Coffman Park. Enjoy music, dance, shopping, culture, art and more. It’s fun for all ages and those who aren’t Irish, but do like to have a great time. See you there!